Foods can be delicious looking and good for you too! In a smallish mixing bowl, stir together the flour and salt. Working quickly, rub the butter into the flour with your fingers until you have a mixture with pea-sized butter lumps. Make a well and add in the egg and water. Stir together until it forms a messy dough in a bunch of clumps, adding a tiny bit more water if it seems too dry. Scoop the clumps together and press it into a ball. Flatten into a thick disk, wrap with plastic wrap and refrigerate for at least 45 minutes. On a lightly floured surface, roll the chilled dough out into a circle about 1 inch larger in diameter than your tart pan. Gently transfer the crust to the tart pan and press it in. Either trim the excess crust or fold any overhanging edges back inward and press them into the crust, reinforcing it and making it thicker. Put the tart shell back into the fridge for 30 minutes. Preheat your oven to 350F. Prick the tart shell all over with a fork, then line it with foil or parchment paper or aluminum foil (cover the sides and edges too) and fill the bottom with beans or other weights to weight it down. Place it on a rimmed baking sheet to prevent drips, and bake in the oven for 30 minutes until lightly golden. Remove from the oven, remove the weights and lining and return the crust to the oven for another 5-10 minutes, until nicely golden brown. Remove the crust from the oven and allow to cool completely. Blend together the mascarpone, chevre, lemon juice, and lemon zest (either in a blender or by hand with a wooden spoon). Set aside. In a blender or food processor, whir together the basil, olive oil, garlic, and a large pinch of salt until blended. When the tart crust has cooled to room temperature, spread the cheese mixture in the bottom. 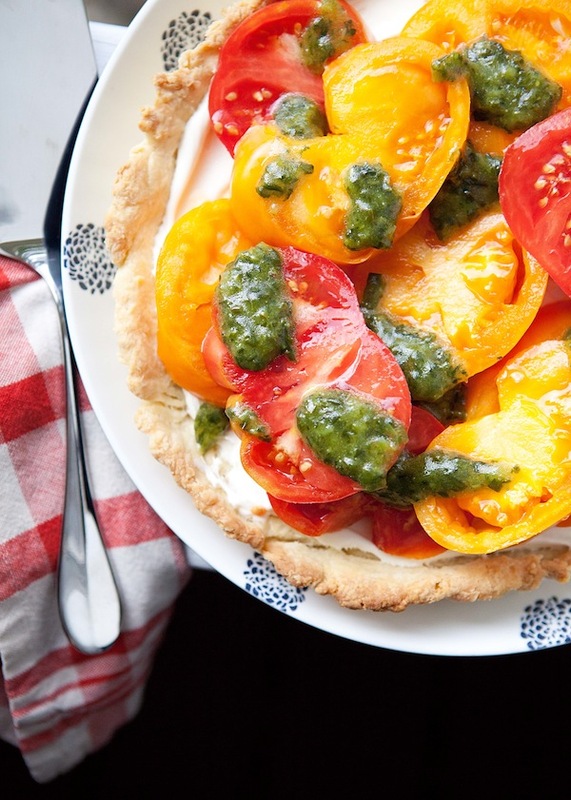 Layer tomato slices over it, then drizzle with the basil oil, and sprinkle with salt and pepper. Serve at room temperature with a nice green salad. I would recommend that you do not serve the tart chilled. 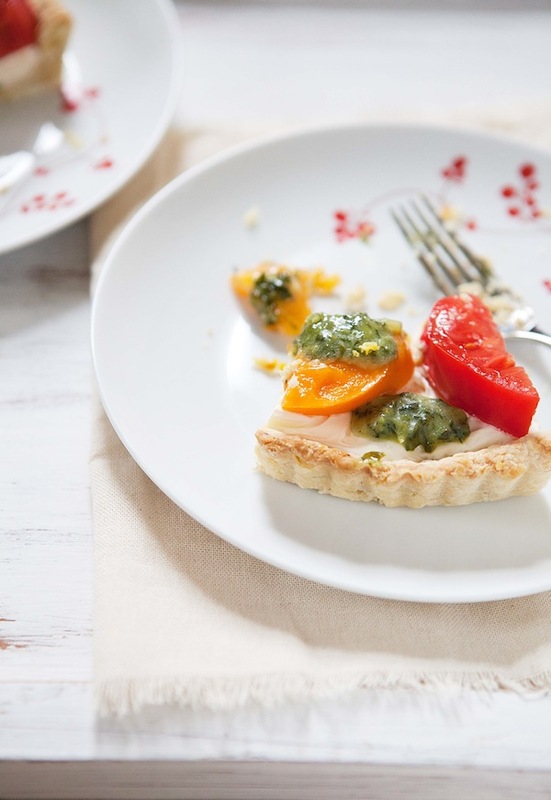 If you refrigerate the tart, be sure to let it come back to room temperature before serving.